President Obama today plans to commemorate the passage of the Civil Rights Act of 1964, signed into law 50 years ago this summer, at the LBJ Presidential Library in Austin, Tex. The historic legislation sought equal access to employment opportunity, public accommodations, public education and voting rights. 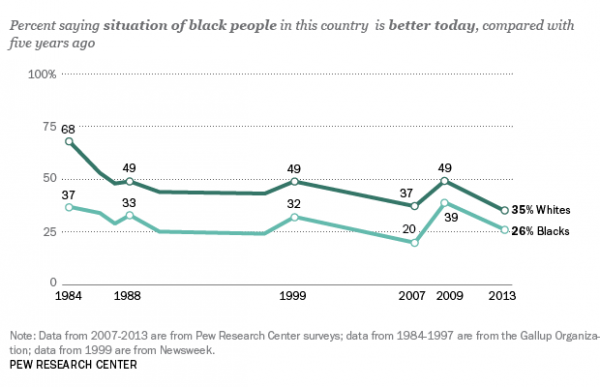 A poll conducted six years after the landmark bill became law found signs of perceived improvement: 64% of African Americans said things were “getting better” for most black people compared to four or five years ago, according to a national Harris Survey. Fast-forward to August 2013, when just one-in-four blacks (26%) who answered a similar question agree with that statement, according to a Pew Research Center survey conducted before the 50th anniversary of the March on Washington. That was down sharply from the 39% who said the same in a 2009 Pew Research survey conducted the year Obama took office as the nation’s first black president. In the August 2013 poll, about eight-in-ten blacks (79%) said “a lot” more needed to be done to achieve racial equality, compared with 44% of whites. Some 32% of blacks and 48% of whites said “a lot” of progress had been made toward racial equality over the past 50 years. The 2013 poll also came shortly after Trayvon Martin verdict. On July 13, a Florida jury found George Zimmerman, a white Hispanic, not guilty of murder in the shooting death of Martin, an unarmed black teenager. The verdict sparked outrage nationwide.